In this tapestry we see the pomegranate fruit, based on a work by Parisian artist and botanist Pierre-Joseph Redoute. In 'Redoute Pomegranate', the precise detail of this fruit and its leaves are on display, reflecting the passion that Redoute had for his botanical subjects. He published over 2100 illustrations of over 1800 species of plants, many of which have not been documented by illustrations before his time. The pomegranate fruit is a native of Asia but which has been naturalised in the Mediterranean for centuries, and each fruit consists of over 600 seeds inside. In the northern hemisphere, this fruit is in season from October to March. 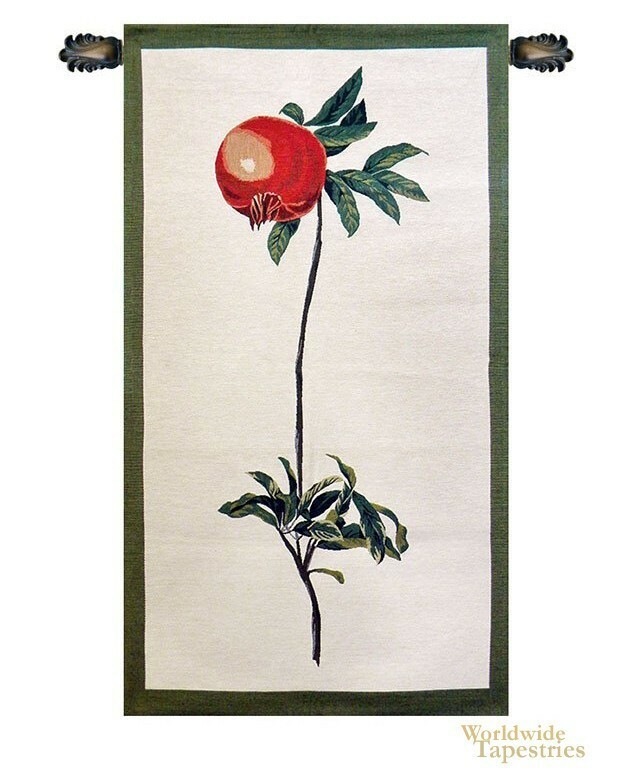 This tapestry is backed with lining and has a tunnel for easy hanging. Note: tapestry rod and tassels, where pictured, are purchased separately.